I believe in everyday cake. I may have remembered to floss four times last week, up from my usual count of zero. I may have had avocado toast one sunny morning at Vif, with za’atar, aleppo pepper, preserved Meyer lemon, and celery(!). I may have even rediscovered R.E.M.’s superlative Green after forgetting about it for twenty years and then sung along loudly and with feeling to “World Leader Pretend” and got goosebumps during the bridge like I used to when I was seventeen. But nothing makes me feel like I’m really living, really doing it up right, like having a cake on my kitchen counter on a weekday. About a week ago, my friend Shari posted a photograph of a cake on Instagram and declared, “New favorite, I think!” Instagram has more shots of cake than there are particles in the Milky Way galaxy, but then again, you may remember that Shari is the person who, six years ago, introduced me to sweet potato pound cake. Her opinion is not to be questioned. And as I studied her photo, I realized that her cake, pale gold and splotched with berries, was from a recipe that I had read and dog-eared only the night before, as I thumbed through the March issue of Bon Appétit: a simple, single-layer cake enriched with whole-milk ricotta and spiked with frozen raspberries. Ding ding ding! So I picked up some ricotta over the weekend, and on Monday afternoon, when I found myself with a free half-hour, I made a cake. This is a cake that you can actually throw together, not just in word but in deed: there’s no mixer required, just a spatula and a whisk and an arm. The batter is thick and rich, like a mousse, and bakes up light, pillowy, terrifically moist. (I know everybody hates the word moist now, but I don’t mind it. British recipe writers seem to be into damp, but that usually reminds me of basements, or other people’s towels, or the point in a day at the beach when your bathing suit starts to itch.) A few people on the Bon Appétit website have commented that they would reduce the sugar, but I wouldn’t: it’s just right, especially against the tart shock of the berries. If anything, I’d up the amount of raspberries by a third or half – or, whoa, hey, maybe try it with frozen sour cherries instead? Ricotta and sour cherries. That’s doing it right. P.S. If you’ve got time to make your own ricotta, do. There’s a recipe in Delancey, and what you don’t use for the cake, you can use on crostini, on toast with jam, in pasta, on pizza, stirred into eggs, you name it. P.P.S. More everyday cakes here. And this looks a little more involved, but man oh man. P.P.P.S. Earlier this week, I wrote on Saveur.com about one of my favorite things, the seven-minute egg. P.P.P.P.S. Luisa started a good discussion about food magazines, and I’d love to know what you think. And this P.S. thing is getting ridiculous, but P.P.P.P.P.S. 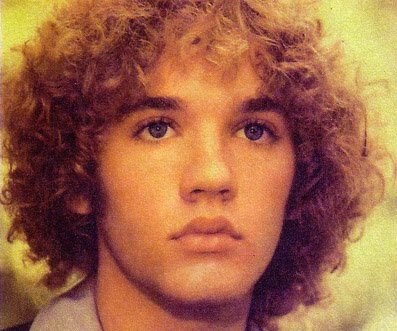 My favorite (ancient) photograph of R.E.M.’s Michael Stipe. Preheat the oven to 350°F. Lightly grease a 9-inch round cake pan (I used springform), and press a round of parchment paper into the bottom. In a large bowl, whisk the flour, sugar, baking powder, and kosher salt. In a medium bowl, whisk the eggs, ricotta, and vanilla until smooth. Gently stir ricotta mixture into the dry ingredients until just blended. Then fold in the butter, followed by ¾ cup of the raspberries, taking care not to crush them. 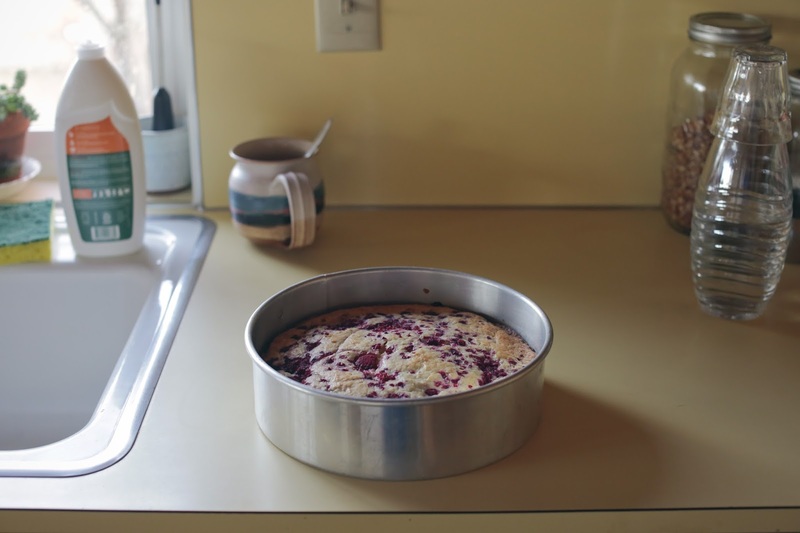 Scrape the batter into the prepared pan, smoothing it evenly, and scatter the remaining raspberries on top. Bake the cake until it is golden brown and a toothpick inserted into the center comes out clean, 50 to 60 minutes. Let cool at least 20 minutes before unmolding. Cool completely before serving. Pi today, cake tomorrow. This cake looks wonderful, and I love the short ingredient list. I’ve made this cake many times now. It has a wonderful soft texture and a great balance of flavors. I reduce the sugar to three quarters of a cup and increase the fruit. It’s wonderful we sour cherries and it’s wonderful with sour cherries and raspberries together. I am going to make it for Christmas , that’s how much we love it. Oh, and it doesn’t hurt that it’s easy to make ! OMG I dog-eared this cake a few weeks ago as well! Great to see a positive review. I'll make it soon! ps: i used ricotta from a local small dairy, and i do think it made all the difference. Like Luisa, I'm not renewing my subscription to BA. It's too full of fancy-schmancy—stuff I'll never make. Now, if it was loaded with straightforward recipes like this one? I'd be a loyal fan FOREVER. Oh, that picture of Michael Stipe. Beautiful. I bookmarked this cake, too, and your post moved it to the front of weekend recipes. Yum! Thanks for the reminder that I haven't read my March Bon Appetit yet. It's a rainy Saturday here and now, I will. I want to try this cake. I looove ricotta. I love that Stipe photo too. He looks like an angel. My copy of Bon Appetit has been folded over to this recipe for the last couple of weeks. I WILL make it this weekend! Today, of course, is for pie! Ricotta in baked goods is usually a good idea. And raspberries! Clipping this. Hi Molly! 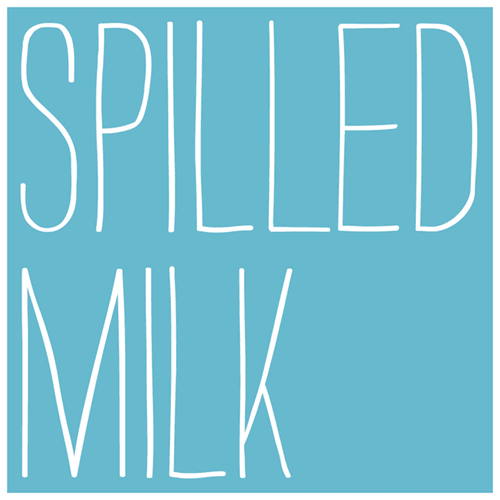 I'm newly obsessed with your spilled milk podcast having finally figured out how to listen to them on my commute (and Serial ended and I'm in mourning like finishing a good book and having nothing good to read). 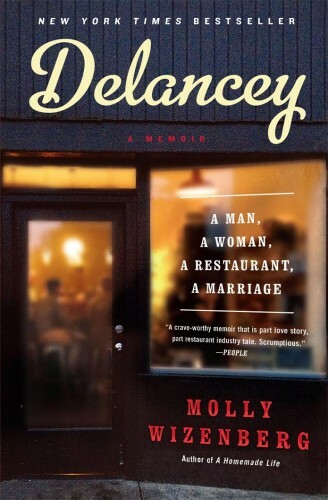 Anyway, I am looking forward to coming to Seattle for business in the coming weeks and dying to try Delancey if we can. I, too, made this cake last week and pretty much ate the entire thing over four days. Oops. BTW, I have a son a few months younger than June. They'd be fast friends 🙂 With much admiration, Kathryn in SF. 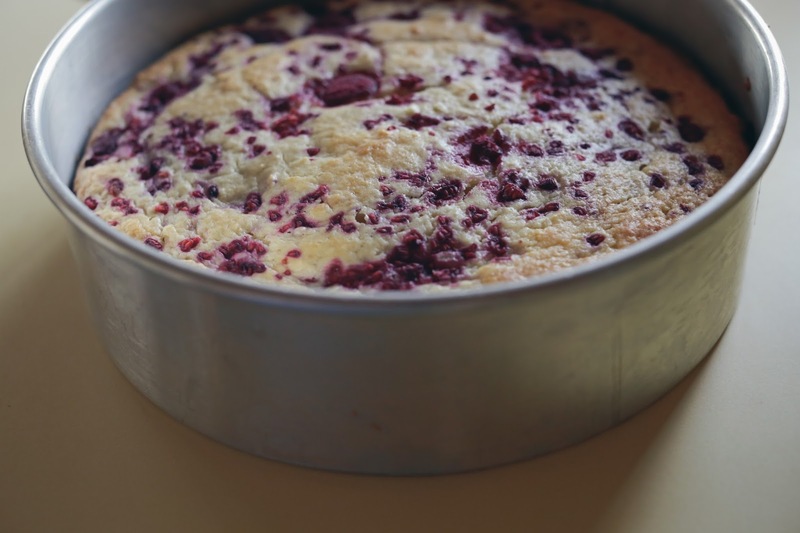 I love the sound of this cake – I have only recently starting using ricotta again (after moving away from Rome it was difficult to find fresh ricotta/get used to the somewhat sub-par flavour of the supermarket brands) and I think this cake should be the next project for using ricotta. And whoever suggested the cornmeal/blueberry variation, I think that sounds delicious too! About the Michael Stipe photo . . . I could take a nap on those lips! I feel weird looking at the photo of Stipe that young and thinking, “Yum”. But those lips! Many older cookbooks (1920s-1930s) feature “Busy Day” cake recipes — Busy Day Banana Cake, etc. I love the idea that even on hectic days, whipping up cake is part of the plan. My 10 year old has taken up a baking habit. This recipe will be going to her. I knew I was doing something right the other night because when she was glued to her iPad, and I asked what was so interesting she answered, “recipes”. Fabulous cake and great links, but hey it is the PI Day of the Century today 3/14/15 and you didn't post about a pie in its honor?? Please say that you'll make up this slight at some future (less cosmic!) date! Ok, will go back to the market to buy the ricotta that I didn't remember to buy today. Don't think I'll find raspberries this time of year, but there are some early strawberries that will do just fine! 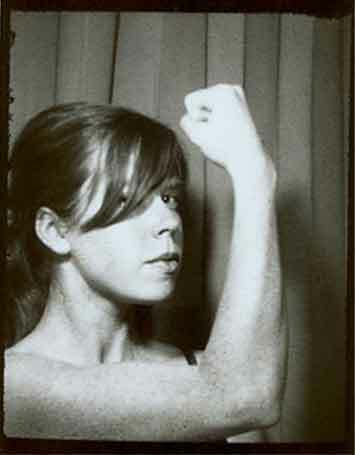 “Reckoning” for me, always and forever. Love the pictures of this cake Molly! A real cake, on a real bench, and it looks delicious. This is exactly how I feel. When I have a cake on my counter on a weekday and some biscotti in the jar I feel like I'm doing it right. I began to feel like this when I moved on my own and my boyfriend used to be around for more than a day. It made me feel like I was adding something nice and home-made to our daily routine. this said, it's the kind of cake I love to my make, bookmarked for next week! I am absolutely going to make this cake. I even have raspberries in my freezer. And thanks for reminding me why we all wanted to kiss Michael Stipe way back in the past! I bought all the stuff to make this the other day, now I can't wait! And although I have been super annoyed with BA and was going to cancel as of last month… the March issue came and while it's still annoying, I've made several STELLAR dishes out of it. So… conundrum. Feeling like I maybe don't have to make any kind of statement with the food mags I subscribe to at the moment, so for me, I think I'll stick with it as long as most of the recipes are good. Isn't that what it's all about?! Maybe not for everyone, but for me it is! I love “plain” little everyday cakes. Did you really use frozen raspberries? I get Cook's Illustrated Annual (as opposed to getting the magazine monthly) and Garden & Gun (only for Julia Reed's column The High and the Low), and am about to resubscribe to The New Yorker because I expect to have time to actually face a weekly issue and not feel like it's a job. I look at ALL the cookbooks on my shelves and think, “Really, maybe I should spend a year cooking only from Essentials of Classic Italian Cooking.” Every time I discover something I've never made and make it, it's delicious. All those unexplored recipes are sitting there. 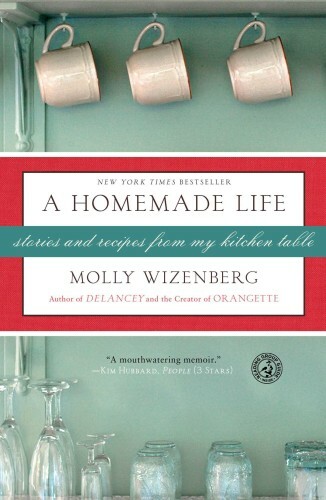 I'm down to four blogs: Orangette (obviously); The Wednesday Chef; Rachel Eats; and :pastry studio, – where I love the writers, and the writing, and the recipes. (Full disclosure – I occasionally visit Ruhlman.com – he of the best fried chicken in the world, including when you use boneless thighs!) It isn't that there aren't many other great blogs, it's that I don't want to get totally swept away on the computer. Also: Made your seven-minute egg last night, and enjoyed it with ricotta (purchased for this cake recipe) and asparagus. It's the egg I've been dreaming of my whole life. Thank you for sharing! I've made this case twice in the past week or so, most recently two days ago (and it is all gone). I used fresh raspberries both times and placed them in the batter, rather than folding them in–gorgeous. And the whole milk ricotta is what I did as well. As a final touch, I sprinkled the top with some crunchy sparkling white sugar from King Arthur Flour. Delicious!!! On the cooking mags–dropped mine some years ago. I pick up the odd issue of one or another. Most of my inspiration for new recipes comes from some well-chosen bloggers or cookbooks. Looks delicious – and moist! From a British point of view I can confidently say that the word “damp” is never positive. Definitely to be used only for basements and old towels. It's like you knew I had ricotta floating around my fridge waiting to be used, and raspberries in the freezer! As far as BA goes, I cancelled my subscription several years ago when a new editor took over and they started shooting all their photos on lightboxes. I felt like it was just getting too snotty for me, or maybe I started to care about different things. Although, I heard at one point it started to get good again, so maybe I missed out on some good years. I don't get any cooking magazines now, and happy to get my inspiration from food blogs that keep things simple, and delicious. Time to bake a cake! Thanks for the recipe! I've been planning on making this cake. Glad to see your review! I have another 'go to' recipe for a similar cake. It was in Gourmet – April '07. Rhubarb Strawberry Pudding cake. http://www.epicurious.com/recipes/food/views/rhubarb-strawberry-pudding-cake-238103 Easy to substitute other fruits. It's a great recipe to prep early and then assemble and bake right before you sit down to dinner. I think you'll like this. I am a long-time Cooks Illustrated subscriber, though I despise their marketing methods (you MUST beat them back strongly with a stick, they auto-enroll you with each book purchase in a auto-send plan, and they call at all hours!). The recipes are the most reliable of any magazine source I have experienced. I also like Saveur, although that is a travel/food mag. I still miss Gourmet. Cake looks awesome. Molly, that was a perfect observation…and so deftly-described! I appreciate your lovely writing. Thank you. Couldn't agree more about the food magazines, for the most part they all look alike and cater to 20somethings that all have boho apartments, I miss some of the old and beautiful issues like Gourmet. I love getting my cooking magazines every month (Bon Appetit, Food and wine, and Sunset.) I don't always find something I want to make right away, but they punctuate my month nicely, and are fun recreation. I have noticed that Bon Appetit's new editor and move to NY have made it a little less interesting to me, a west coast cook. A little more formal, different ingredients, just a little different vibe. Blogs are great, and I read them too,(I'm a regular!) but I love getting my physical object in the mail, and reading something that isn't ever plugged in! Rainy rainy day yesterday – I read Bon Apetit cover to cover and THIS CAKE jumped out at me! Making it tonight – thanks! I just ran across delicious – a food magazine from the UK – and really loved the January edition. Now to see if I can continue to find it! I like to browse food magazines in general but the comments about BA had occurred to me too. I usually like Saveur though (because the travel stuff enchants me). Katie's post from yesterday summed up exactly why I let my longstanding BA subscription finally die. For many years, my Thanksgivings were spent making recipe after recipe after recipe from the November issue. And don't get me going about barbecue in July. Or December cookies and desserts. Or October harvest recipes – my God, the pies! After the most recent editorial change it just wasn't cutting it for me. I held on for 2-3 more years hoping it (or I) would find a groove again. Alas, no. THANK GOODNESS I have kept all my old stash. Thanksgiving was delicious this past year. I found a good beef pot pie recipe on BA last month, which made me waver with regret for a moment, but I got over it. Your post and this debate has made me nostalgic for what once was. This is a cracking recipe Molly! I'm wondering about the ricotta, here in Australia we have ricotta you can cut and ricotta you can scoop out of a tub, which one works for this cake please? 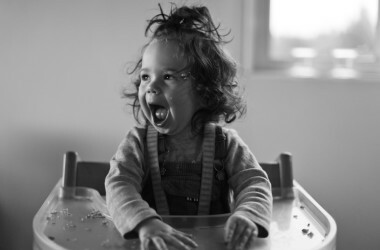 While I applaud your flossing, I'm really excited about the cake. 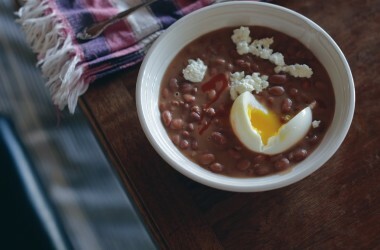 This is the only recipe I flagged from the March issue… Can't wait to make it! Also, I need a cake to take to a work thing on Monday and this might just be the one! p.s – I feel like I have skimmed the last few issues of BA and nothing really stands out, I don't mind the aesthetic but I'm not sure that the content is really there. Had all the ingredients on hand and so christened my brand new Bertazzoni with this lovely cake. Wonderful! I made this cake with modifications and regretted it. Do not, under any circumstances make this with cup for cup (gf flour, leftover for cooking for a gf friend that I wanted to use up) or reduce the sugar by half. You will be eating a very dense, sad cake. However, I would recommend using blackberries, they were the highlight of this attempt! I will definitely attempt a do-over. I thought this cake looked good too, but I haven't gotten around to making it. It looks like I'm in the minority but I enjoy getting my cooking magazines in the mail. 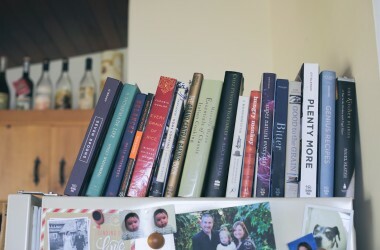 I only read a handful of cooking blogs, so maybe that has something to do with it. In many ways I think that the magazines are trying to catch up to the style of blogs, so it's interesting that people think they're snotty. I will have to try this one but no today, because yesterday I made your 'French style yogurt cake with lemon'. Guests coming today will probably devour it with glee and appreciation. Pleased to report this cake is a success with frozen cherries. Added bonus: Given that this is a machine-free cake that whisks together in less than five minutes, it is an ideal cake for making with a two-year-old. I refrigerated mine because of the ricotta. Are you keeping yours out on the counter? Your yoghurt lemon cake from A Homemade Life is my everyday (and special day) cake. Just made it for my 9-year-old's birthday at her request. Despite the fact that this cake looks amazing, I have to agree with Luisa on BA. They're so into being trendy. The last straw for me was the “Food Lover's Guide to the Super Bowl”. Except I think it was mistitled. More fitting would have been a MEAT lover's guide to the super bowl. Wendy, you should use the kind of ricotta that you scoop from a tub. And Molly, I kept my cake on the counter. Seemed fine! Oh my gosh, I made this cake last Sunday and it was super tasty. Got happy nods of approval from each and every family member and we decided it is a perfect brunch item when next we do a homemade brunch. Raspberries were the right fruit for it. I used fat free ricotta to minimize a bit, still heavenly, plus a portion of unsalted butter and a portion of canola due to the fact that my dog ate the stick of butter right out from under me. (Of note: her name is Molly too and she has since earned the title Molly McButter due to her incessant butter eating, ingesting wrapper and all with nary an intestinal complaint-It IS what we have served her medicine in, in her defense). I made this as a weekday cake too! And used a little poetic license: swapped the flour for 1/2c flour, 1/2 c buckwheat flour, 1 c almond flour and omitted the butter. Buckwheat and berries are delicious together! Would be even better with sour cherries. Did anyone else's cake turn out soggy? I followed recipe exactly and it took over 60 min to bake (not high altitude). It seemed almost raw in spots. I'm a good baker so am a bit mystified. Maybe my frozen raspberries had too much water in them? I used springform pan. I love Mollie's recipes. Anonymous, that's so disappointing! I'm sorry to hear it. What kind of ricotta did you use? I wonder if that could be a factor: maybe yours was wetter than average? Molly! I love you almost as much as I love this cake. My best friend and I have made it countless times with different types of ricotta and it always takes more than 75 minutes to bake. We live in Houston, so defitely not an altitude issue. In fact, just baked it tonight for thanksgiving and came over to comment on the timeing. Peace, love, and cake all day every day! I happen to have frozen sour cherries from our very own tree in the backyard and plans to make ricotta very soon! I will be making your idea on varying this! Sounds perfect for a spontaneous spring party or brunch. Do you have a conversion table from cups to grams? I made the lemon yogurt cake (another yummy cake) today but had to look up every conversion. Hi Debbie! I only began posting recipes with both weight and volume measures a couple of years ago, and yes, it's definitely a bummer that old recipes don't have both. I don't have a conversion table on the site, but I can tell you that I measure 1 cup of all-purpose flour as 140 grams, and 1 cup of granulated sugar as 200 grams, if that helps. This Raspberry Ricotta Cake looks amazing. It made me sit up a little straighter in my chair! I REALLY can't wait to try it! Thanks so much for the awesome recipe. Okay, enough about the cake. Let's talk about that beautiful Blue Eagle pitcher next to your sink! I first saw their ceramics in Austin, TX this summer, and have been obsessed ever since. They're just stunning. I love everything about this post! Having weeknight cake totally makes me feel like I am doing it right too (and ditto for the flossing and music!). I made this cake tonight, even though it is a Saturday, I still totally feel like I am doing it right! It is super yummy, and simple! It took a little longer to bake than the recipe calls for, but I think that is because my oven runs cold. I am still experimenting to see how to best compensate for that. But, regardless – even with the extra minutes the cake is a total winner! Thank you!! Loved this cake! Shared with my adoring neighbors as well. A cake for all ages. Since I did bake it in a springform pan, I wondered if it would have been nice with a graham cracker crust pressed into the bottom. An adventure for next time! Goodness, that just looks yummy…am wondering though, would the ricotta have to be room temperature? That's a good question, Evie. It doesn't need to be at room temperature, no. And fresh ricotta should be soft enough that it's easy to scoop, even straight from the fridge. Loved this cake! Super moist, and just the right amount of tartness from the raspberries. (I used a quarter cup more than the recipe called for.) Cake was still pretty undercooked after 60 minutes, but perfect after an extra 20. Maybe the raspberries were too wet? I made this cake for a neighborhood Easter dinner and it was a BIG hit! I decided to bring along a bowl of whipped cream to dollop on and that made it extra delicious. I had the last piece for breakfast the next morning (without the cream) and it was super. Thanks for the recipe, I'll definitely make it again. Ricotta and Raspberry…why not! The cake looks pretty and I think this will be a perfect everyday cake! Thanks for sharing! Gah!!! I just accidentally swiped (ugh stupid smartphone) and lost the whole comment I was writing. It may be for the best though, as it was a long and rambling comment. Long story short: no frozen raspberries available here. Fresh ones from far far away coming in by air: um, no-no… Frozen strawberries? Fresh ones from the same place didn't taste great, but let's how for the best right ? Wrong ! Cake made with lemon zest and aforementioned frozen strawberries: great crumb ! Lousy fruit (picture pockets of shriveled up tasteless greyish-pink pucks amid a pillowy light fragrant crumb). Think think think… Sour fruit ?? Dried prunes ! Far Breton ! Buckwheat ! (because Bretagne, galettes etc etc you get the point) whoa free association is powerful! 2. Swapped about 50 g of the flour for buckwheat flour. 4. Inhaled cake, while thinking how much better this was than a Far Breton (no stodgy custard sticking to the roof of your mouth, warm aroma of buckwheat surrounding the soft sweet -sour prunes). All I can say is: please please please try it ! Now, tomorrow, this fall, whenever ! But please do. And I hope you will love it as much as we did. Thank you so much for the inspiration ! Love this cake. Every time I buy ricotta, I always end up with about a cup or so with nowhere to go. Halved this recipe and baked in a 6-in cake pan and it was perfect! Really moist (!) and flavorful. Added a 1/2 teaspoon of almond extract as well. A definite keeper. I’ve just made a gluten-free version of this using Cup4Cup flour (although I weighed everything) and fresh raspberries. Absolutely delicious – thanks for the recipe; it’s a keeper! I substituted sour cherries and it was divine! Served it with slightly soupy black cherry ice cream- people raved- Many thanks! Just wanted to make a slightly off-topic comment; you mentioned your recipe for Homemade Ricotta in Delancey, and I LOVE that recipe so much! I tried it side by side with two other ricotta recipes, and yours was my favorite. It might be the cream 🙂 Definitely the buttermilk gives it a wonderful flavor. Any homemade ricotta is yummy, but yours was especially good. Thank-you for sharing the recipe! This cake is unbelievably good. Even my picky boyfriend, who doesn’t usually like fruit-filled cakes (Inconceivable! ), raved about this one. Made as written, with one extra flourish of my own that I highly recommend: I sprinkled the top with raw turbinado sugar before baking to get a crackly, sweet lid. The crunchy top meeting the moist middle and fragrant raspberries is a stellar combination. Forgot to mention that I used fresh raspberries, for those wondering if that’s OK: a big yes! We used berries we had picked ourselves, that were on their way out and breaking down a bit — and still the cake was blissful!